Manufacturer, exporter and retailer of exercise book, laboratory note book etc. Paper- 60 GSM Orient D.T.P.P. Paper inside pages printed with green colour. Cover - 120 GSM Poster Printed with four colour. Binding - Wire Stitching Bound. Variety - Inch, Centimeter and two milimeter are available varieties. 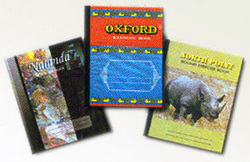 Paper- 70 GSM Maplitho paper with high bulk and extra whiteness printed with grey colour. Cover - 80 GSM Poster Paper printed with bi-colour. Binding - hard board binding with 22 Q mill board and cloth on spine.